Toronto’s most frequented and delicious street festival is gearing up for another year of cultural celebrations. Taste of Little Italy is a summer tradition for many Toronto residents and beyond. It’s the perfect social event for those looking for something to do in the city and best of all, it’s free admission! I hope you’ll post this to your listings to let your audience know when and where to find all of their favourite food, drinks and entertainment this summer. Below is information on the festival and I’ve attached a photo for you to use as well. Friday, June 15, 2018 6:30 p.m. – 1:00 a.m.
Saturday, June 16, 2018 11:00 a.m. – 1:00 a.m.
Sunday, June 17, 2018 11:00 a.m. – 10:00 p.m. 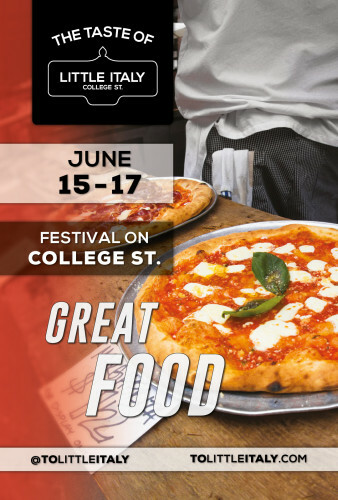 Explore the tastes and sounds of Italy right in the middle of Toronto as College Street transforms into a classic Italian piazza for Father’s Day and the FIFA World Cup opening weekend. Come celebrate and have fun with delicious food and great music! And the best part? Free admission!